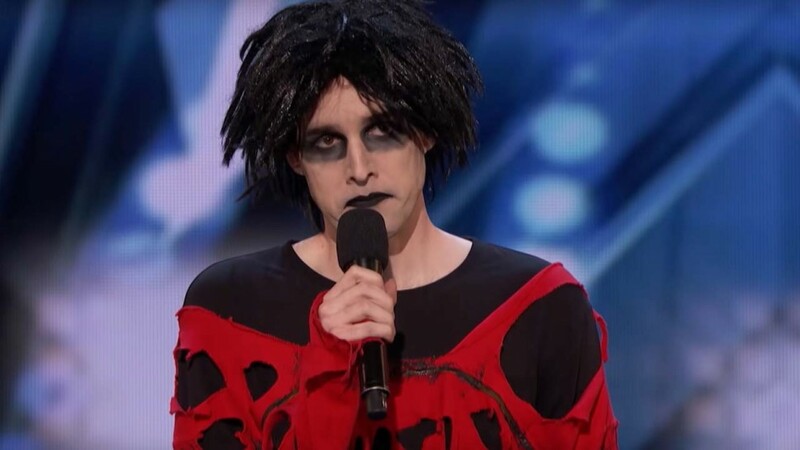 When Oliver Graves took the stage on Tuesday’s America’s Got Talent, the 32-year-old goth performer surprised the judges when he revealed that he’d be doing stand-up comedy for his audition. Given his jet-black lipstick and eyeliner, greasy black hair and shredded red shirt over his all-black ensemble, the judges really had no idea what to expect when he came out, but when he finally got a chance to do his set, they quickly came to appreciate his comedic genius. Throwing out well-crafted one-liners in the vein of comedy giants Steven Wright and Mitch Hedberg, Graves skillfully lampooned online dating, horoscopes and self-deprecation in a stand-up routine that was brilliantly served by his dead-pan delivery and unusual style. From the first joke, he’d already won over the audience, and the standing ovation he received at the end of his set took Graves by complete surprise. As Howie Mandel, Mel B and Heidi Klum showered him with compliments, he couldn’t hold back his emotions. “Well, enjoy your free time right now, because you’re going to be a busy man,” Mandel said, smiling. After getting four ‘Yes’ votes and moving on to the next round of competition, Graves choked back tears while talking with host Tyra Banks backstage. As she was cheered on from the side of the stage by her family, Phillips belted out the powerful ballad with heart-bursting honesty, and the commanding audition moved Klum to bestow upon her the coveted Golden Buzzer. The honor means she moves on the live shows at the Dolby Theater in Hollywood, this skipping the Judge Cuts rounds, which kick off next week. America’s Got Talent airs Tuesdays at 8 p.m. ET/PT on NBC. ← Ashlee Simpson and Evan Ross Welcome Fans Into Their World in First ‘Evan + Ross’ Teaser — Watch!